Get Ready for the Great American Smokeout this Thursday, November 20th! Make this the year that you really quit smoking for good! Tobacco use remains the single largest preventable cause of disease and premature death in the United States, yet about 42 million Americans still smoke cigarettes. The benefits of quitting smoking start only minutes after your last cigarette, and they multiply as time passes. In as little as two weeks your circulation and lung functioning can improve, and as time passes your cancer risks get lower as well. Quitting is not easy, but going through it with a partner or a friend can help make the journey a little easier. 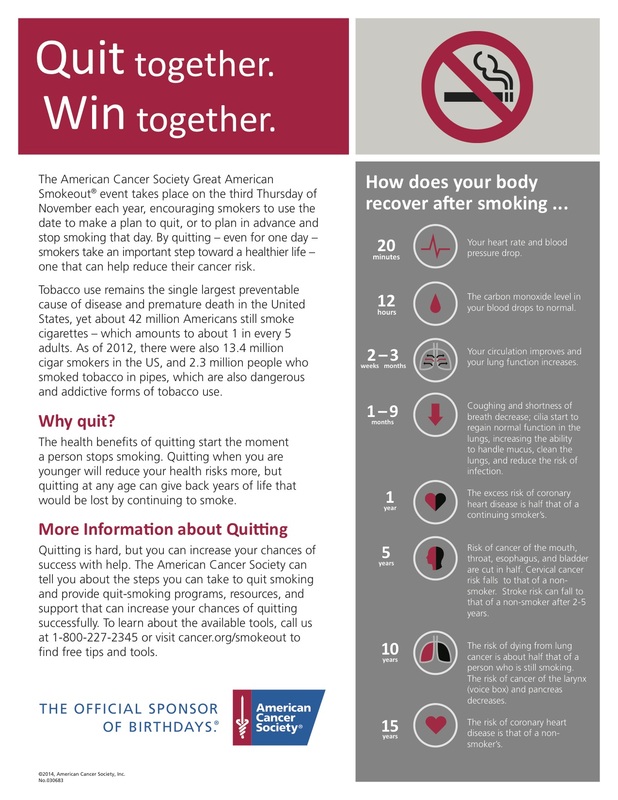 For more information visit the American Cancer Society at www.cancer.org. Previous Post Help Us to Plan Our Future Presentations! Next Post Have a Happy & SAYF Thanksgiving!